While we love printing botanical graphics in an amazing print, there is something about a single fantatic color that adds another unique look to an older favorite and adds something a little more. Something earthy, perhaps, or maybe even a touch of the tropics. In this case, we were channeling the modern, tapa-inspired prints of the Polynesian islands. Our design is direct, clear-cut, and immediate, making this table overlay absolutely perfect for adding visual interest to any table. 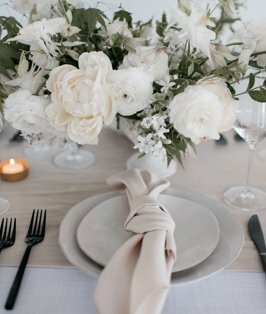 Because it is sheer, our table overlay can be combined with so many colors found in our table linen rental, that the combinations are ENDLESS. It is well-suited for corporate functions, or your favorite garden societies, in addition to other events that want to add that tropical flare with fabulous nature based colors.